Yes, the opening round of qualifying is only 10 minutes this year. Kevin Harvick had power steering issues in the practice session earlier. He’s the first car on the track in qualifying. Joey Logano is loose on his lap, he lifts. Logano will have to make another lap. He does and it’s not good enough but he shut it off. Logano said he intended to make two laps in his second run. Out of habit, he shut off the engine. Logano will not advance to round two. Clint Bowyer wins round one of Atlanta Motor Speedway qualifying! The field is closer than ever. And the fast guys, they have their foot on the floor all the way around the race track. The low line is the fast way around. But, the track is worn, it’s sandpaper. The tires fall off quick. Some drivers are moving up the track in round two. Power steering issues continue for Kevin Harvick. He’s knocked out in round two. He can’t turn it to the right. The team has changed everything and they can’t figure it out. “If we had to race right now, we’d be in the garage and headed home,” Kevin Harvick says. Clint Bowyer picks up where he left off in round 1. He takes quick time in round two! It’s the run for the Atlanta Motor Speedway pole. Clint Bowyer and Austin Dillon are in a race off pit road as the green drops on the final qualifying round. Hamlin and others are trying to draft. Previously, you’d want clean track in qualifying. It might work with this new package. Less than a minute remains, Aric Almirola jumps to the top of the board! He quickest in Atlanta Motor Speedway qualifying for the Monster Energy NASCAR Cup Series! It’s his first pole since Charlotte in 2012. 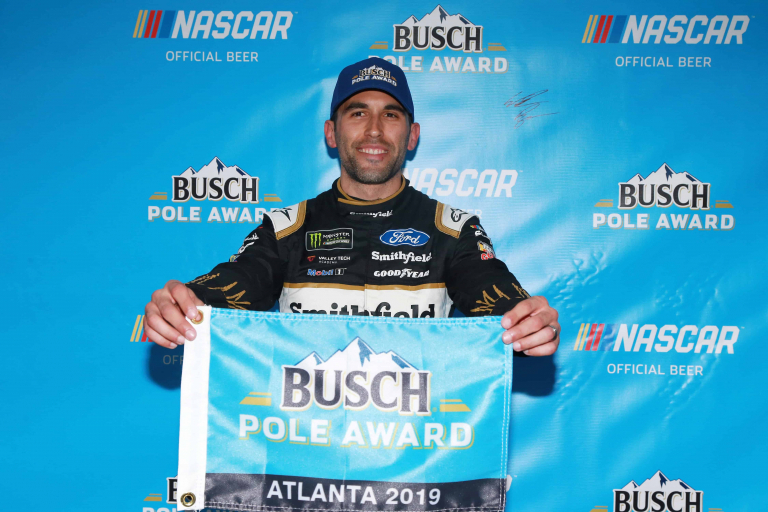 His first ever pole in Atlanta.